Jad Bell is a member of JSOC. The Joint Special Operations Command is a department of the U.S. Military tasked with identifying and eliminating terror cells around the globe. As such, it works, sometimes closely and sometimes begrudgingly, with "civilian" agencies such as the NSA and CIA to discover, track down, and stop those who would bring destruction to the United States. Its members, especially the actual boots on the ground, are made up of Special Forces personnel trained to operate in all terrains and skilled to hit and hit hard. Jonathan Bell, Jad to his friends of which he has a fair number, is one of the most experienced and qualified of the men and women in the field for JSOC. Over his two decades of service to his country he has risen in the enlisted rank to the position of Master Sargeant (E-8) and as such often fills the roll of First Sergeant for his group, earning the title of Top Sergeant. At or near 40 years old, Bell's body shows the penalties of all that he has endured with scars from bullets, shrapel, knives, and other deadly intrusions but for all the wear and tear it has seen, it still is in better shape than most men his age. Forcing himself to run seven miles a day as well as other exercises keep him fit and able but with each year, the effort gets a bit harder. Bell's private life has suffered from the many years he has given his country. Married to the love of his life, Amy, for almost his entire adult life, that relationship has come to an end just before the first recorded adventure, a casualty of ten years in Iraq and Afghanistan and not at home helping raise their daughter, Athena. The love is still there but time and distance proved too much. Athena also has paid for her father's absence. Deaf, she had learned how to deal with hardship but learning how to deal with a dad she loves but does not really know is a strain. As the series begins, Bell, freshly divorced, has left the Service and moved to Alaska for a clean break. The fight against terrorism will not let him go for long and he is brought back into the battle. Alongside some of his old Army buddies with nicknames like Bonecrusher and Chaindragger, Jad Bell, with his own nickname of Warlock, goes where duty calls. Wilsonville is the world's largest amusement park. On this day, it is scheduled to become the largest mass-murder site in history. Jad Bell is placed undercover as the head of security to stop a plot that will start with a bomb and then get worse. The terrorist known as the Uzbek, the man who staged the attack on Wilsonville, is the prime target for Jad Bell, an undercover operative who is still reeling from the previous assignment. The Uzbek is not done, though, as he and his boss, the Architect, has more planned. 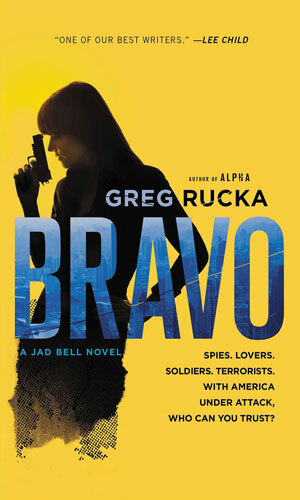 I have been a fan of Greg Rucka for years and the addition of Jad Bell as one of his series does not lessen that admiration at all. Mr. Rucka knows how to craft a story and create a plot line that keeps you moving along with him. Bell is interesting because he is just a bit up there in age and so has experience and regrets but can still show the young-uns a thing or three. I will admit to being, as ever, less than thrilled with present tense writing. It never feels rights, being so different than the norm, and try as I may to find a reason to use it, I always come up blank. It gives no new insight as far as these old eyes can see and it is, well, annoying. And that is the only thing I can find fault with this action-packed series. Bell is a darn good hero and he is joined in his escapades by several equally good people with whom he has a long and good relationship. He could be a loner if he needed to be but he can work and play well with others and the banter between the group is realistic and enjoyable. I hope we see more of Bell. Right off the bat, I must admit that I almost stopped reading the 1st book after 50 pages or so. I find myself almost "demanding" action in books I read some where at least reasonably close to the beginning to keep my interest. That was my mistake with Alpha & I am sooo glad I did not put it down! What started off slowly turned into a book that I couldn't put down for more than a few minutes at a time. Polished it off in a day & ordered Bravo online before I was done. 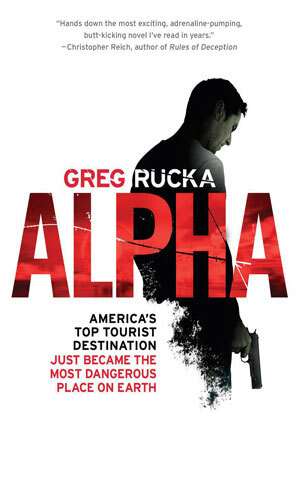 It was my 1st Greg Rucka book but believe me when I say that it will not be my last. After Bravo, will be digging into his Tara Chace series!